A first class Hotel on the Beach, Foote Prints on the Sands Hotel has a welcoming atmosphere that emphasizes friendly and hospitable service. The hotel has excellent facilities as well as warm and comfortable guest rooms and public areas. All of the guest rooms are nicely equipped to give a feeling of being home while away from home. The hotel also has a variety of facilities and services that are sure to meet the needs of both business and leisure travelers. 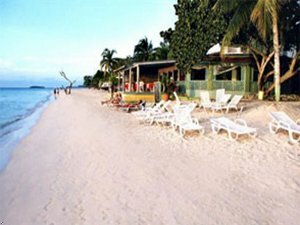 The Hotel is situated on Negril Beach in Jamaica, and is approximately 100 km, 60 miles from Sangster International Airport. The on-site Reggae Spa offers massages, manicures, and hair braiding. Airport shuttle service is provided, and self parking is complimentary. Jamaica is known as an upscale island, but Foote Prints makes it possible for people within every budget range to find the perfect place to stay.